It's been a nice weekend. Paul spent the weekend on the east of side of the state, visiting friends and attending a baptism. Samson and I have had a nice, relaxing weekend in EGR. Saturday, Samson spent time with his furry friends Coke and Kenya and ran out all his wild puppy energy. 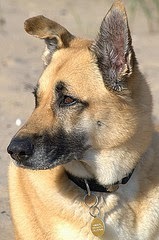 It is so wonderful to spend time with them - he goes nuts chasing Coke, and Kenya the perfect German shepherd, herds them both. It is so much fun to watch them. By the end of the hour, they were all resting in the snow, with big long tongues. HB slept for a good long time. The Red Wings beat the Boston Bruins last night. It was a slow starting game but Detroit kicked it in during the second period and won the game, 3-1. The Wings are really on a tear but as every hockey fan knows, the playoffs don't even remotely resemble the regular season. They need to be able to keep it going. Sunday afternoon's game is the NY Rangers playing Montreal. It's a good game. This morning, we slept in. I did some work this morning, finished up the laundry and had to run a few errands. I picked up a few vittles at the local D & W, a place I normally try and avoid. I am not a big fan of shopping in general but specifically, I really can't stand grocery shopping. I can't quite pinpoint it but I usually end up leaving the grocery store irritated and spend the drive home trying to figure out why. I came away with a couple of thoughts after today. Why I hate grocery shopping, chapter 1. First, nothing seems logically organized to me. I know that it's a shopping trap but milk and bread are at the far back of the store, hoping to trick me into buying something I don't need. But my foot hurt today and that was just aggravating. And no, I didn't buy anything OFF my list. So there. Then I get to the 15 items or less line and D & W has the world's slowest checker. It's like she is intentionally slow. I had 11 items, well under the number allowable in the SPEED checkout line with the world's slowest checker. She says to me, "how many items do you have?" Well funny you should ask, I HAVE 11. I wanted to yell but I didn't. Then I walk to my car, carrying my two bags with 11 items and I see the most peculiar thing. D & W offers service to carry and load bags in your car. I see a man, probably in his mid to late 50s (I am terrible with ages) standing at his Mercedes Benz watching a D & W employee load his groceries. What struck me was the person loading his groceries was a woman probably about his age, loading all those groceries while he just stood and watched. He just stood there. Doing nothing. Now maybe it's the lack of sun and vitamin D that has made me grouchy or that it has been cold and yucky around the rusty mitten or maybe even that it's the end of football season ... or a combination of all three. But I really wanted to walk over to this total stranger and ask him why in the world he couldn't load his own stupid groceries. His arms didn't appear broken. He was standing on two good legs. He was even making small talk with the woman loading his car. I even had other things I wanted to say but this is a G rated blog so I will leave it at that. If I didn't have Paul, I would probably be one of those people who buys Schwans to have my food delivered, avoiding grocery shopping altogether. Samson is sitting at my feet sleeping. He is having furry little dreams and his last dream must have been a doozy. He was jerking and murphing in his dream and then all the hair went up on his back. Clearly something fun was happening in his dreams. :) I laughed out loud and woke him up. He looked a me for a moment and then put his head back down. More furry dreams for him - to run, chase and play. Time to move around some laundry and enjoy the the rest of the hockey game. Oh yeah, and watch some football game too. Is winter losing it's allure, perchance ? ?